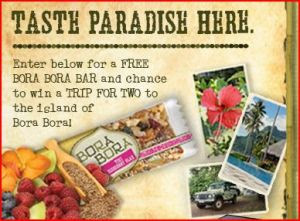 Head on over here and request a free Bora Bora Organic Bar. You’ll be entered to win a trip for two to Bora Bora…..that sounds so great right now. Anything has to be better than this cold weather in Missouri!! Oh, but if you live in Alaska, Florida or New York – sorry, but you aren’t eligible to win the trip.